With me today is William R. Short of Hurstwic, LLC. His website, Hurstwic, has been a source of invaluable information while writing several of our fantasy novels, including Bleeding Edge. William was kind enough to offer his time and expertise to be a guest here today discussing Viking fighting moves. William: Sword and shield combat is often associated with Vikings, the fearsome warriors from northern Europe in the early medieval period. But the Vikings left little behind to teach us how they fought with their weapons or the fighting moves they used. Although our sources of information are limited, it is clear that Vikings were relentless in the pursuit of their goals. Their fights did not take the form of big, hairy men chopping at their opponents as if trying to cut down a tree. Instead, they were bold and direct in their fights, and they were clever. They did what was necessary, when it was necessary to do it, using the tools available to succeed in their struggles. They used their fighting tools in unexpected ways, and they found new tools, improvising a weapon on the spot. Warriors sometimes entered a fight with weapons in reserve: for example, with a spear in one hand and a sword hung from the other wrist by a loop. The fighter began with the spear, but as the fight progressed and the long-range weapon was no longer the best tool for the fight, he dropped or threw his spear and flipped his sword into his hand, ready in an instant to continue the fight at closer range. Fighters sometimes hid a reserve weapon, such as a one-handed axe, behind their shield. They fought with sword and shield, gripping the shield around the axe haft. When the sword was no longer the best weapon for the fight, they dropped it and grabbed the axe to continue the fight. Sometimes people threw their weapons. Spears were often thrown, but so were many weapons not intended as projectiles. For example, both swords and shields were thrown in fights with lethal effects. 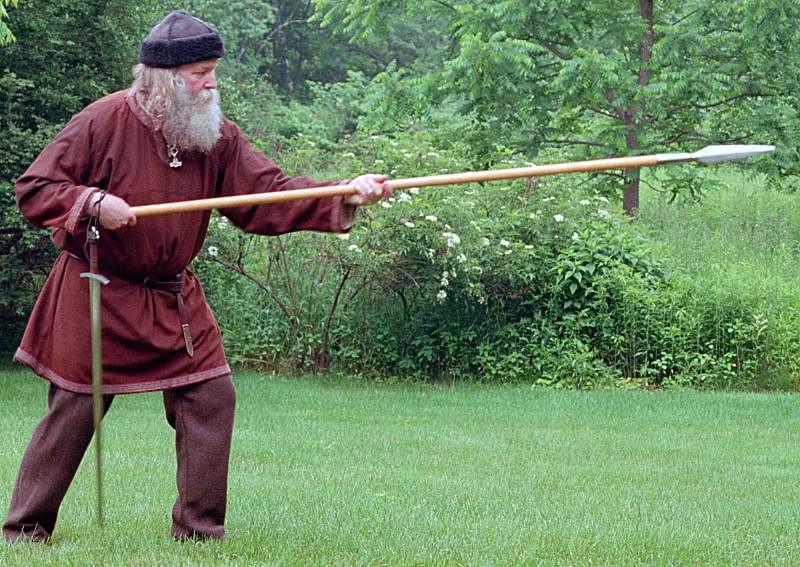 Viking-age people delighted in grappling, practicing it as a sport and using it in combat. When it made sense, a warrior might throw down his weapons and run under his opponent’s guard to get a grip, allowing him to take the man down, break his back, or bite through his throat. At Hurstwic, we research and practice these fighting moves of the Vikings. The moves are described in the Sagas of Icelanders, medieval stories about Viking-age Icelanders. 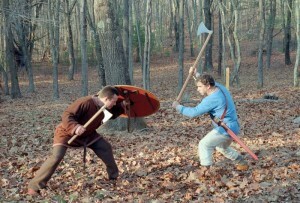 Our research suggests that generally, the fights in the sagas represent realistic Viking-age fights. Other sources, such as forensics, help back up what we read in the sagas. The bones of Viking-age people with battle injuries tell us about weapons, targets, and injuries and make it easier to accept the incredible stories in the sagas. The horrific effect of Viking-age weapons on flesh and bone can be seen in the Hurstwic test cut video, using sharp replica weapons on the carcass of a pig. More information about Viking weapons and the “shape” of Viking combat can be found in the Hurstic Viking arms and armor articles. 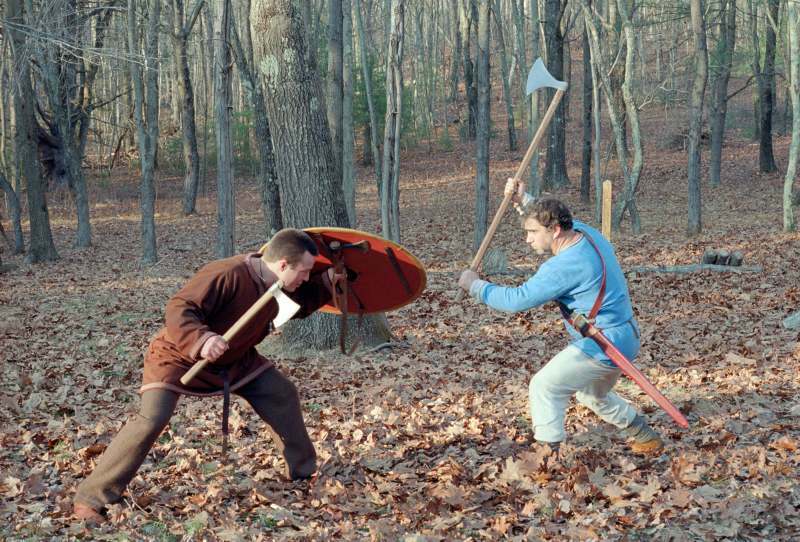 We invite you to join us at Hurstwic in our study and practice of Viking-age fighting moves: at our home base, in central New England; through a Hurstwic affiliate group; or through our series of Viking combat training DVDs.